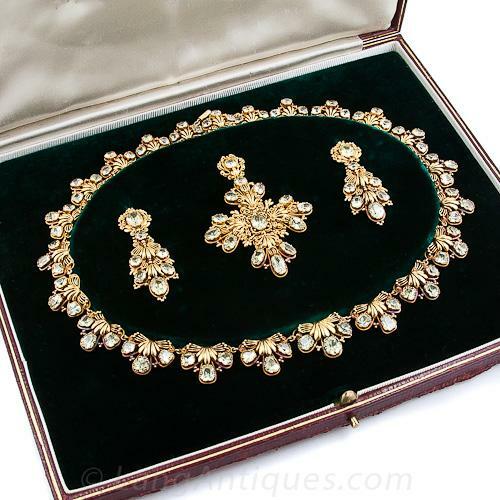 Georgian Gold Parure with Fitted Box. Photo Courtesy of Christie’s. A parure is a full set of matching jewelry designed to be worn together en suite. A demi-parure is a less elaborate suite of jewelry with two or more pieces. The French, in particular, were known to have delighted in wearing formalized and elaborate suites and indeed, the term parure comes from the French verb, parer, meaning to adorn. Parures were traditionally ensconced in beautiful fitted boxes, dazzling in their presentation and always delightful to come across today. A full parure is most typically comprised of a brooch, a ring, a bracelet, a pair of earrings and a necklace but can get quite intricate and, in the case of those worn by royalty, include up to as many as sixteen pieces such as rings, buttons, tiaras, diadems, stomachers, aigrettes and sevignes. Parures became fashionable in the late 1600s when elegant evening salons became popular and jewels were made to complement elaborate formal dresses and signify one’s wealth and prestige. Louis XIV, well known for his extravagant entertainments, had two complete diamond parures to decorate his justaucorps and sparkle in the evening candlelight. During the late 1700s, a much more simple style of dress was favored, one more suited to revolutionary values and parures fell out of fashion. 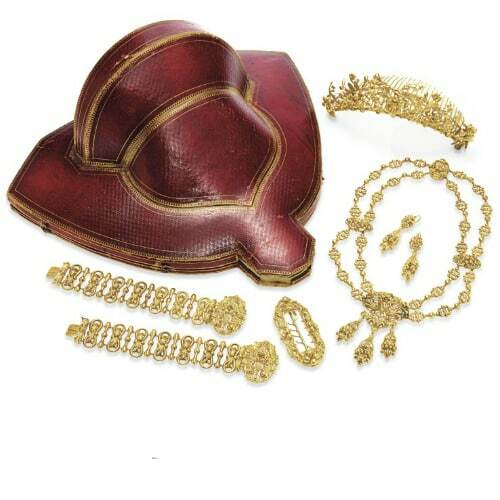 However, they came back into favor during the Napoleonic era, revived by Napoleon himself who loved jewelry and who loved to commission beautiful sets for both his first wife Josephine and his second, Marie Therese. Although generally associated with diamonds and other gemstones, parures have always been fashioned from a wealth of materials and lovely examples exist using popular materials and styles of different periods such as carved coral and cameos. Late Georgian-Early Victorian Chrysoberyl Gold Filigree Parure. Evans, Joan. A History of Jewellery: Boston, Massachusetts: Boston Book and Art Publisher,1970.